How do you know when a project is meant to be a star? Well, being featured in the pilot of a television program is a pretty darned good start. The Hudson by Townline will be featured in the pilot episode of The Design District, a television program which will be aired on CHEK TV this fall. The Design District is a reality TV program that puts together a team of real estate experts and a team of design experts to tackle Victoria design projects. We can’t say we’re surprised The Hudson was chosen to be be one of the six projects featured on the program. 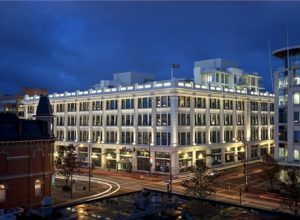 Townline has transformed the historic Hudson’s Bay Building into glamorous apartment homes. The project effortlessly combines old and new, allowing for modern living in a building with unique character. Better yet, The Hudson community is already starting to take shape. Hudson Yoga, 2% Jazz Coffee Shop and The Design House Salon are already open, with RBC and coming soon as well as a medical clinic and Olive the Senses, specializing in unique olive oil. 2 bedroom lofts start at $419,900 incl. net HST and penthouses start from $585,900 incl. net HST. Obviously, we aren’t the only ones getting excited about this project. Not only is The Hudson being featured on The Design District, but they are 80 per cent sold out. For more info call 250.388.0018, or visit their website.